Stylish Retreats | House feeling bare? Try this. House feeling bare? Try this. 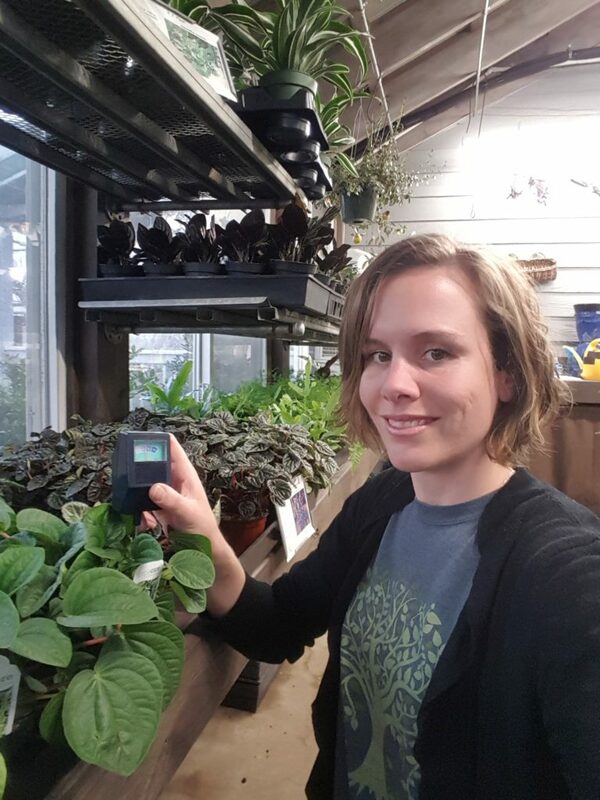 I’m happy to have another guest writer this time and she really knows her stuff when it comes to plants. 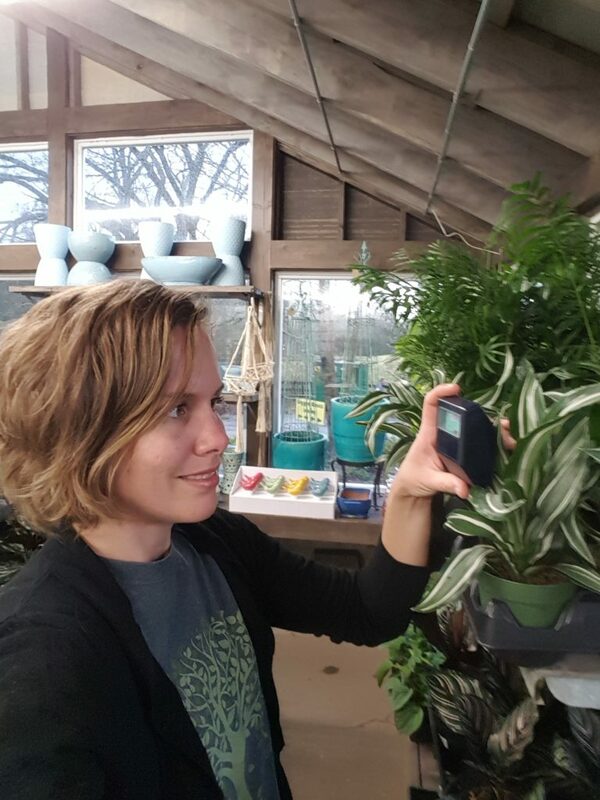 Megan Grimaldi is a horticulturalist who works at Moore & Moore Garden Center in Nashville. I asked for her expertise in selecting and caring for houseplants. Here’s her article with a few side comments from yours truly! Of course I found this sign hilarious when I went to M & M recently!!! 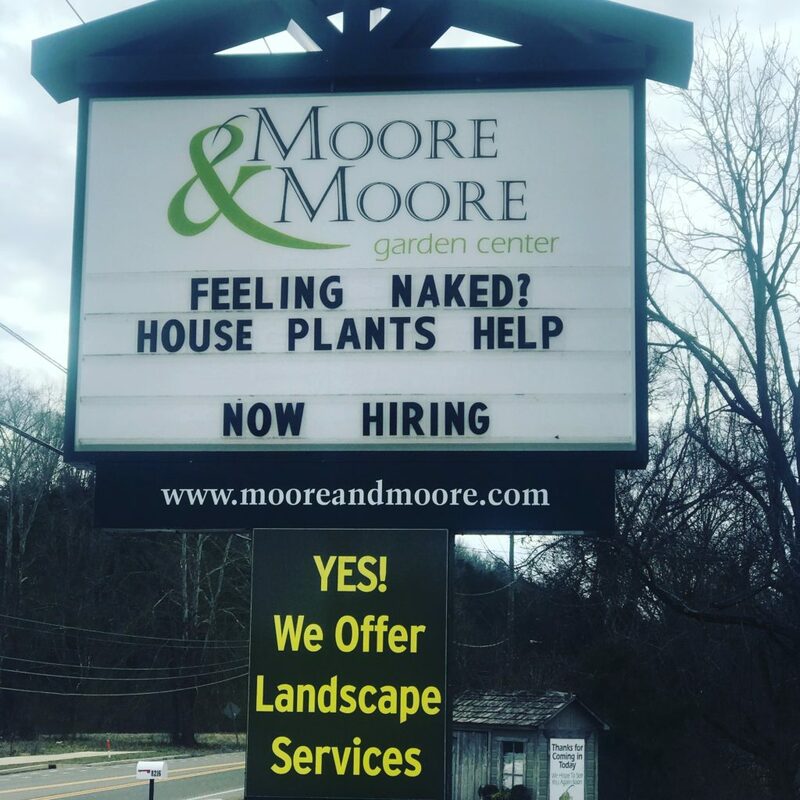 Love their sense of humor. After all the faux greenery for the holidays is tucked away in boxes and store rooms, my home tends to feel bare. You know that feeling. The one where the corner is too empty, the shelf is missing something and the table by the door just needs a little touch of color. 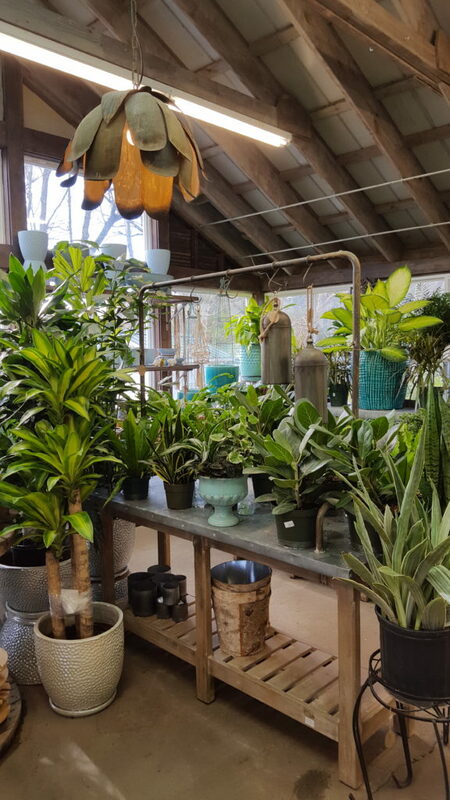 It only takes a few minutes to realize that I need to visit my favorite local garden center for some houseplants. A staple houseplant for me is the Dracaena. 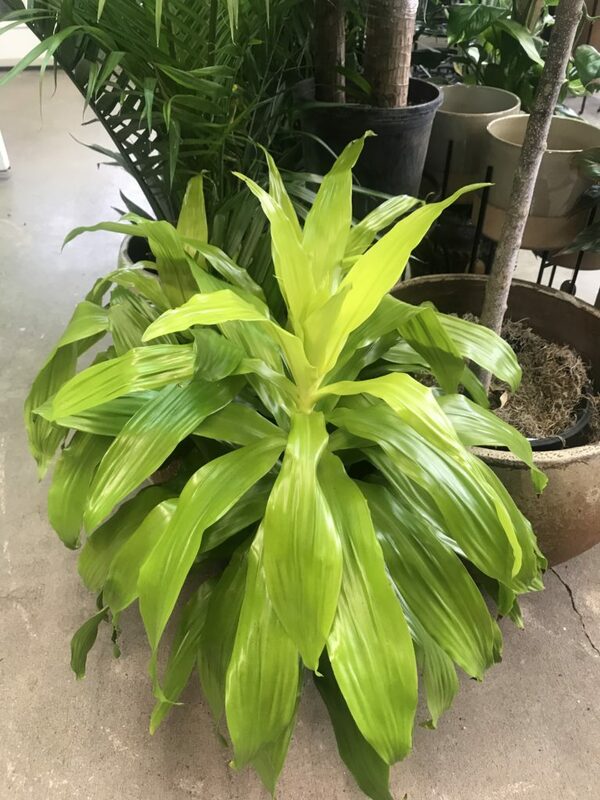 There are many varieties of Dracaena, with a range of foliage colors and leaf styles. Isn’t that shade of green just yummy??? Large growing varieties such as ‘Dorado’ are fantastic as corner plants because they do grow taller and have wide leaves to fill the space. ‘Lemon Lime’ and ‘Limelight’ provide much needed bright color on these gray winter days. Dwarf varieties like ‘Janet Craig’ are perfect for tabletop arrangements. 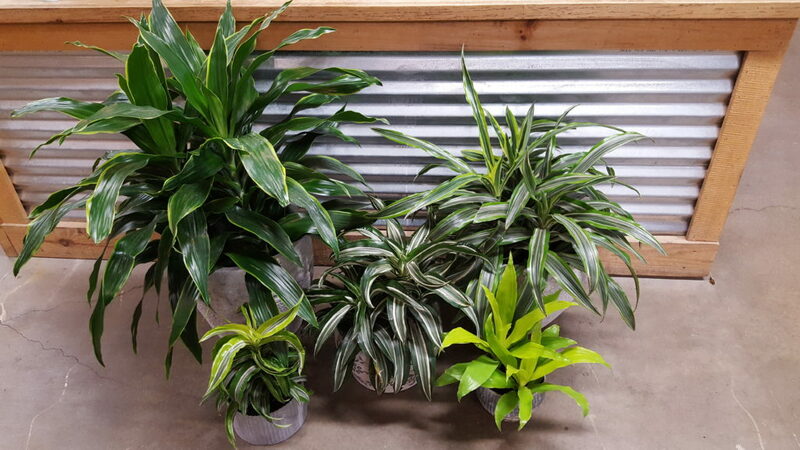 All Dracaena plants like to have moderate light, meaning near a window or bright indirect light, and like to dry out some between watering. 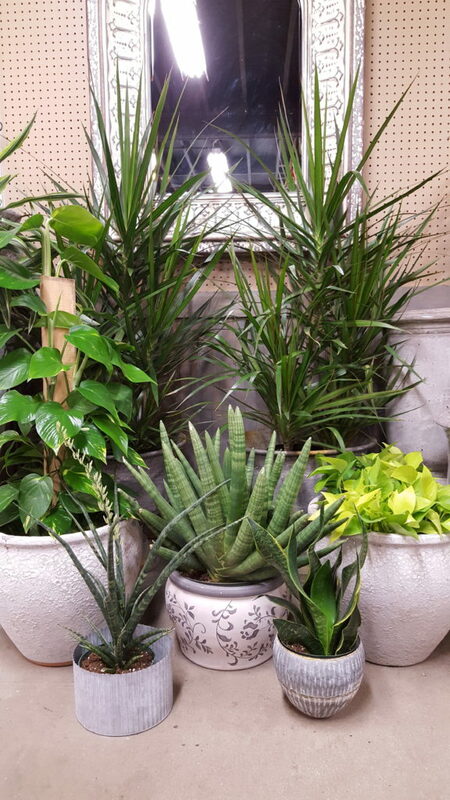 Another terrific choice is the Sansevieria group, also known as Snake Plant or Mother-in-Laws Tongue. These plants can really take dry conditions so they are perfect for folks that may forget to water, like myself. Also they can be in moderate light to low light, think the room that only has one window but doesn’t really get much light. Some of the varieties are almost sculptural, ‘Starfish’, while others are tried and true winners, ‘Laurentii’ and ‘Futura’. I am a yucca fan so I really enjoy ‘Cylindrica’, with its spiky appearance. 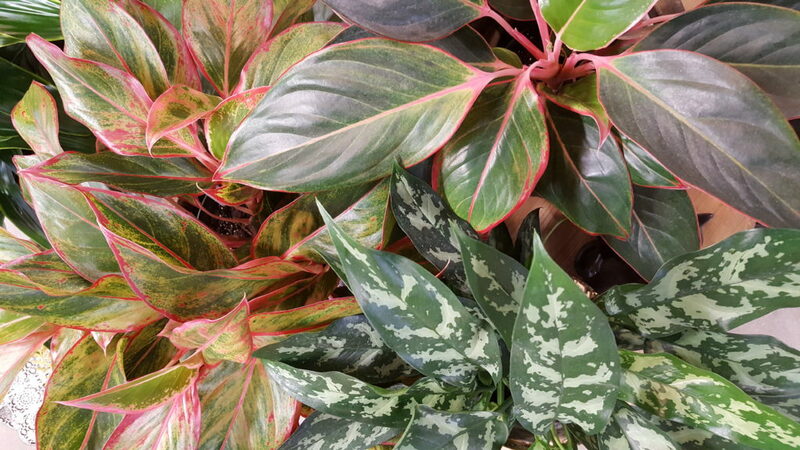 For a pop of color, I have really been drawn to the Aglaonema or Chinese Evergreen group lately. Blooming plants are great but blooms have a life span and a season. I find that ‘Sapphire’ (pink stems) and ‘Red Siam'(red leaf margin) Chinese Evergreen give me that color I crave in an easy to care for package. This is another plant that can go pretty dry between watering and likes moderate to low light. Another choice to add color is Pothos. We probably all know Golden Pothos with the speckled yellow leaves, but have you seen ‘Neon’? It is just that! Bright yellow leaf color that may darken to green if not getting enough light. 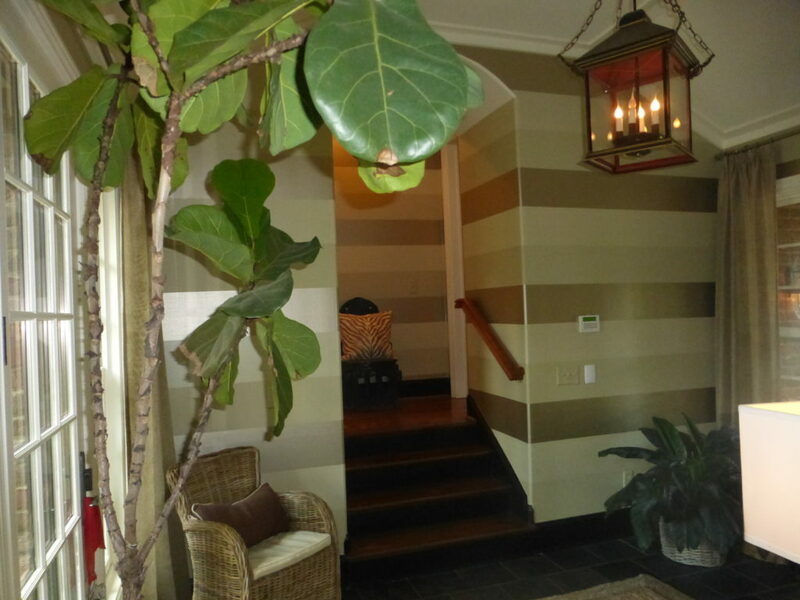 Satin Pothos is a gorgeous sage green with silver overlay. 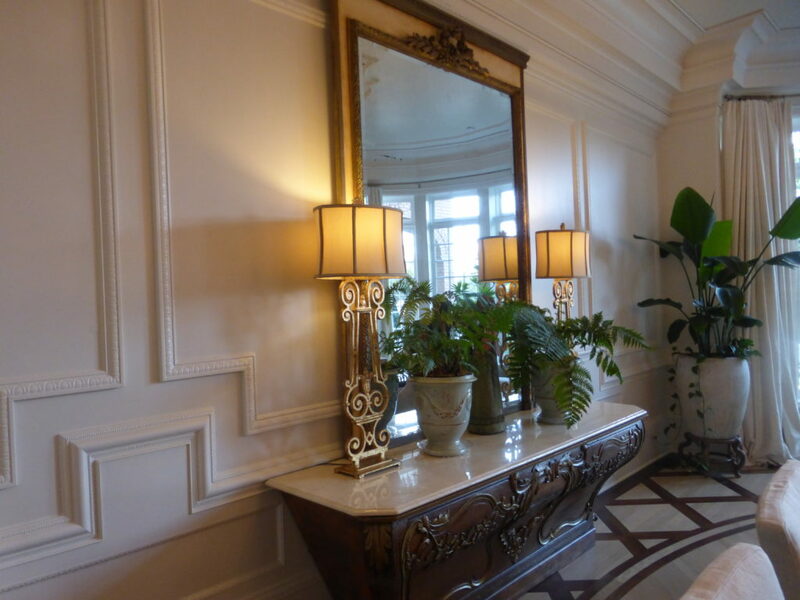 It looks rich and lush, my pick for a foyer table. 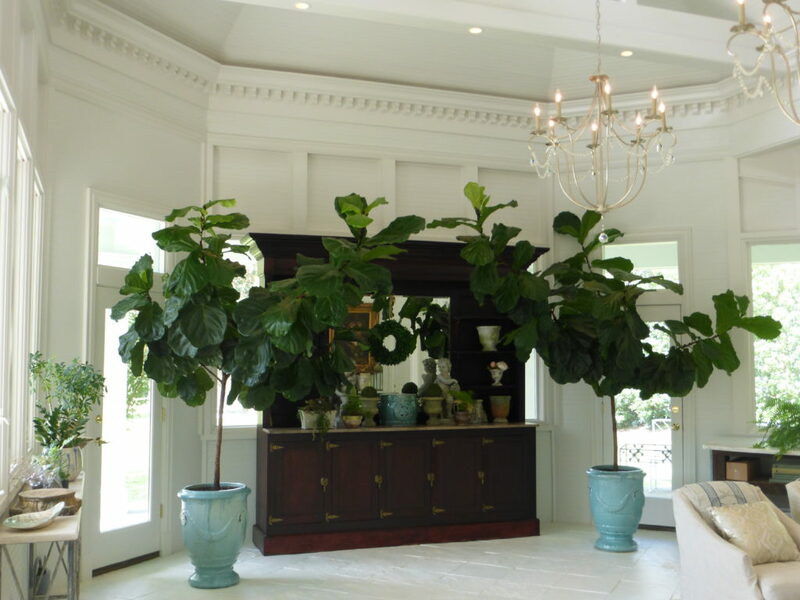 Houseplant care can seem daunting but you may just be loving your plants too much. 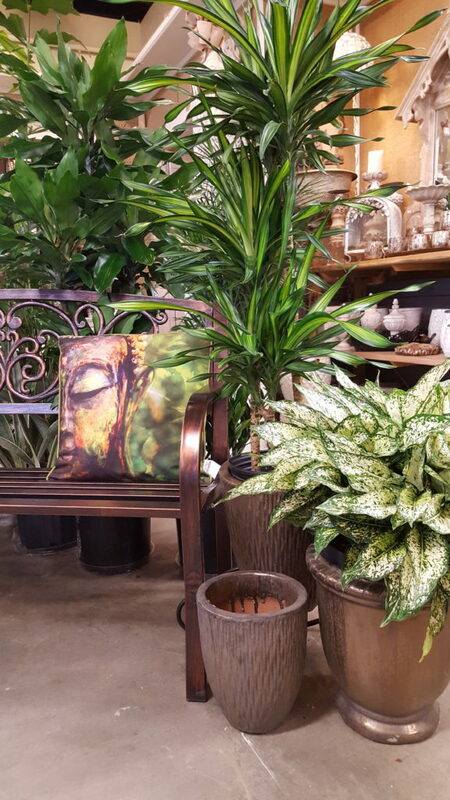 Most houseplants would prefer to be root bound so there is no need to repot every year, usually you can go several years before repoting a plant. Also, most like to run a little dry between watering. When I say “run dry” it means that the top of the soil should be dry and the soil at the bottom of the pot should be just moist. There are exceptions to this rule so check with a sales associate at your local garden center to be sure. 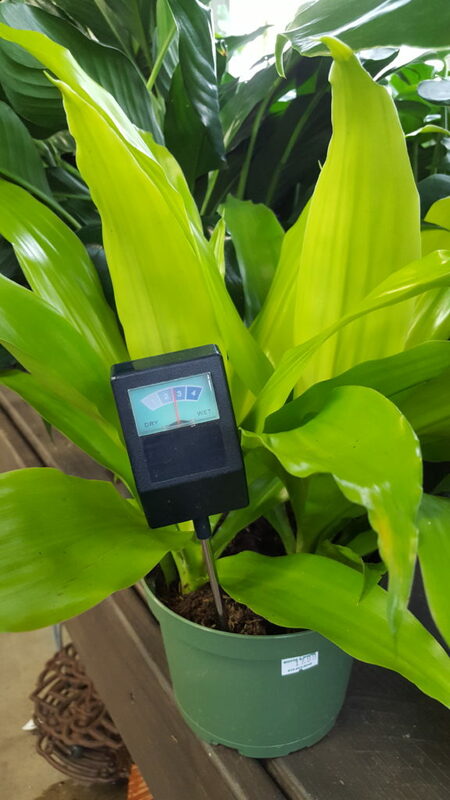 One thing that really helps with watering is a Moisture Meter, sold at most garden centers, it is a probe that rates the level of moisture in the soil. This really takes the guess-work out of watering because the packaging provides a list of plants and when to water based on the reading. During the winter the air in our homes is drier due to heater use, this can cause plants to dry out faster. Try to create a routine or schedule for checking your houseplants to see when they need care. 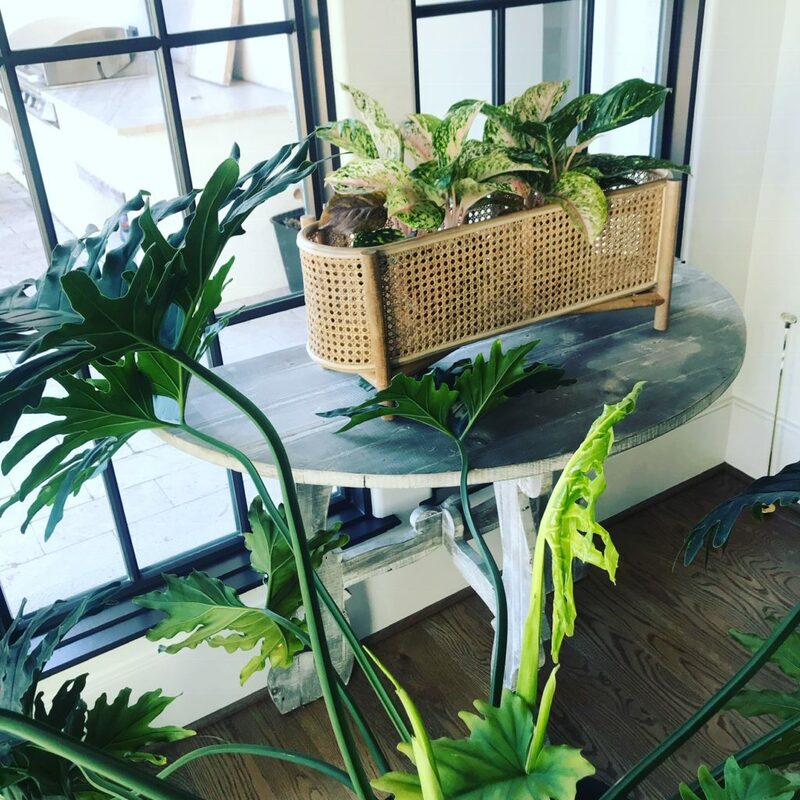 Here are a few of my favorite houses I’ve featured on the blog with amazing house plants that add such wonderful interest to already beautiful spaces. If you have indoor pets please work with someone at your local garden center to find plants that have low or no toxicity. 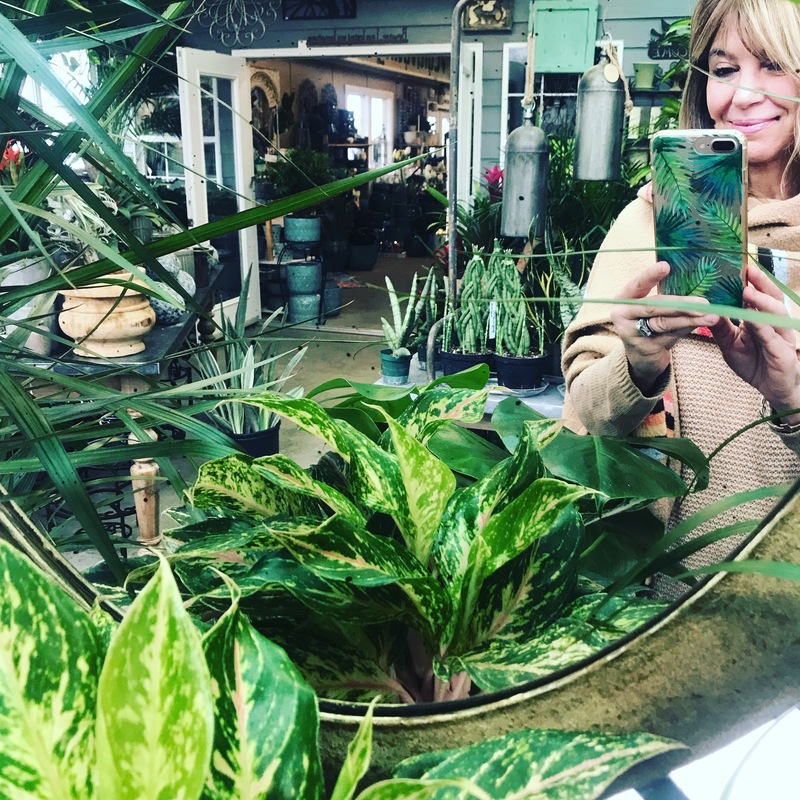 Visithttps://www.flowershopnetwork.com/blog/flower-plant-care/houseplant-toxicity-list/ for a list of houseplants that shows toxicity. 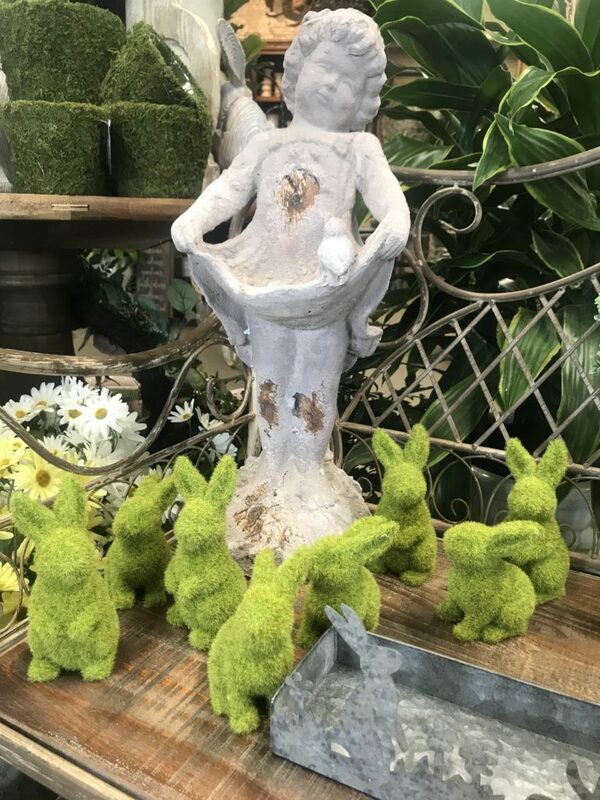 And don’t forget besides houseplants, you could get a few of these moss covered bunnies to help brighten up your tabletops! 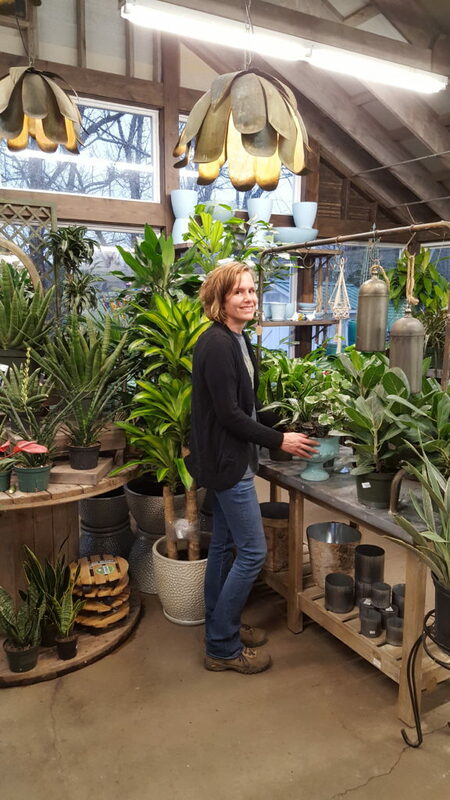 Thanks so much Megan for the plant suggestions and tips on caring for them so you keep them healthy and adding great color and texture to your home for a long time. And thank you for following Stylish Retreats. Be sure to follow me on Instagram too. I appreciate it.